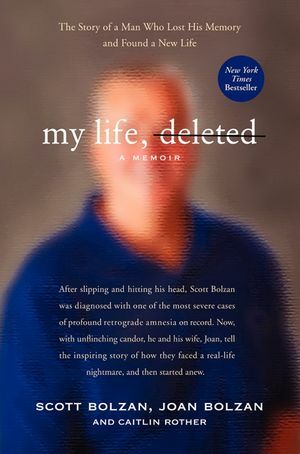 My Life, Deleted—part love story, part medical mystery, and part inspirational memoir—is the true story of Scott Bolzan, the 46-year-old former pro football offensive lineman for the Cleveland Browns who suffered permanent amnesia after a tragic accident. Co-written with his wife Joan Bolzan, this riveting account details Scott's courageous fight to build a new life after losing all memories of his past, his wife and children, his likes and dislikes, and even how to navigate the fast pace and technology of the 21st century. Readers of In an Instant by Bob and Lee Woodruff, Jill Bolte Taylor's My Stroke of Insight, and Richard M. Cohen's Blindsided will be profoundly moved by My Life, Deleted, a remarkable story of tragedy, hope, love, and perseverance.